Eugenia, Ashton, D'Asia, and Emily T.
What is Buche de Noel? 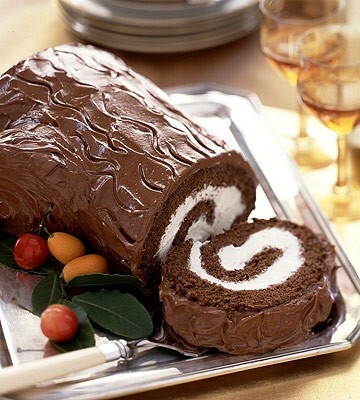 This is also known as a "Yule Log" and to us in America, is the equivalent of a large swiss roll with chocolate mousse filling. Fondant mushrooms often garnish the log as to make the sweet dessert look more like a real log. The mousse filling isn't always chocolate, sometimes it's vanilla cream! Buche de Noel isn't necessarily in the shape of a single log, but sometimes split into two as to again represent the realism. 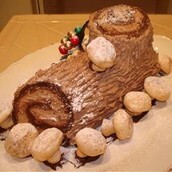 Yules used to be Christmas festivals in European and Germany and a yule log was a ceremonial tree. The family would chop down the tree and take a substantially sized log. The larger part of the log is placed in the fire and garnished with remains from the log ashes in the year prior. 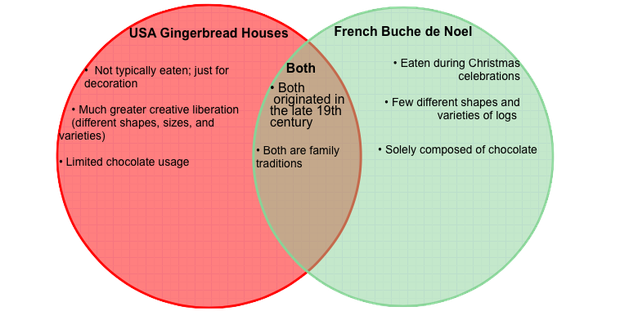 The tradition has since changed and a dessert was created as to resemble the historical significance.